Heinz Weil studied law in Frankfurt and Lyon. After having obtained his qualification as a lawyer and judge in Germany, he moved to France in 1968 where he has been working for five years in a subsidiary of a multinational company. At the age of 30, he became the managing director of this subsidiary. Heinz has qualified as a Rechtsanwalt in 1971. In 1974, he left the management in order to found his own law firm in Paris. In 1986, he passed an additional exam to become a French avocat. He is since then member of the Paris Bar. After having been the resident partner of a large German law firm in Paris, he decided to continue developing and expanding his own firm. Thus, his sons Eric and Bruno and his daughter in Law Mathilde joined him to become his partners. Heinz concentrates on advice and defence in all main fields of business law: he has been handling major disputes in the field of industrial risk and hidden defects, he has advised foreign and French clients in important M&A transactions and taken part in major European wide restructuring of business entities for foreign multinationals, he has often been appointed as arbitrator or counsel for institutional (ICC type) or ad hoc international arbitrations, and handled cases before the European Courts. Heinz is fluent in German, French and English. He regularly participates in seminars to initiate foreign lawyers to French business law. Heinz has been chosen by his profession to assume important functions: He is a former President of the Council of Bars and Law Societies of Europe (CCBE), he chairs the European Committee of the German Federal Bar, he is a Council member of the International Bar Association (IBA) and he has often served as an expert for the European Commission. 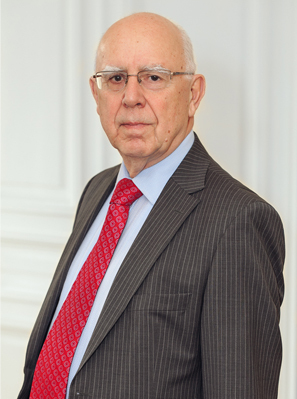 Heinz Weil has been awarded the Order of Merit of the Federal Republic of Germany and of the Federal Republic of Austria.